Greetings! I have not updated this in a while, but I fully intend to in the coming weeks. First, I am no longer with the Central Valley Business Journal. I am now a Media Relations Coordinator for the University of the Pacific, and I’m very pleased about that. I spent about 25 years in newspapers as a staff writer, copy editor, columnist, assistant news editor, opinion page editor, assistant city editor, and finally editor of the Central Valley Business Journal. It was time to move on and it is proving and will continue to prove to be a very positive thing for me. In coming weeks I will post work I did at the CVBJ and some of the stories I am working on at Pacific. It is an exciting time for me and I look forward to the future. What was once a ragged looking parking lot, now is a tool for giving students real-world, relevant educational opportunities to study for future careers that provide clean energy. The solar parking lot – large solar panels installed over six rows of parking spaces – is across the street from the San Joaquin County Office of Education Wentworth Education Center. Already it is helping reduce power costs at the Wentworth Education Center – on one recent day the solar panels captured more energy than the center needed – and reduce the district’s carbon footprint. And students now can go online and view performance data. “I’m energized. I’m of high hope. I am inspired,” Tom Torlakson, California superintendent of public instruction, said at a March 29 ceremony to unveil the parking lot to the community. 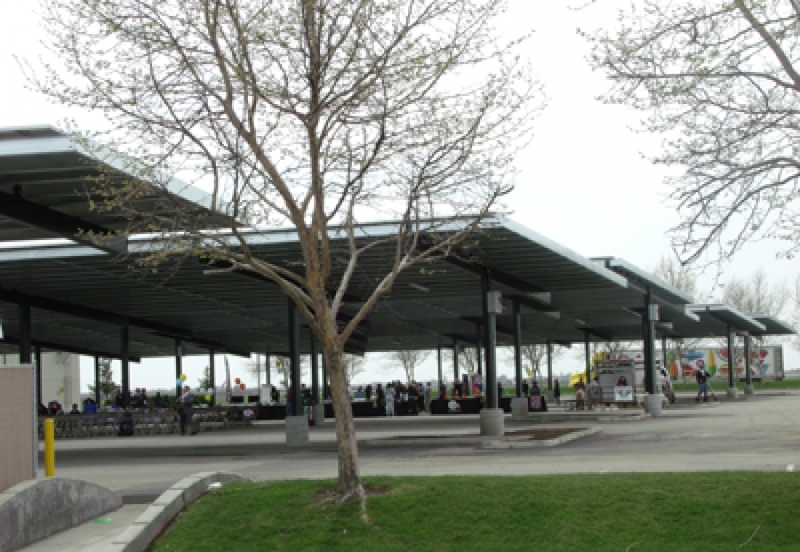 The $2 million San Joaquin County Office of Education solar parking lot will provide students with learning opportunities connected with the solar energy system, according to a statement from the school district. It also will reduce by 86 percent the electricity costs at the county’s Wentworth Education Center by generating enough energy to power 100 homes, offset 28 million pounds of carbon dioxide over the next 30 years, and is the carbon equivalent of planting 60 acres of trees. A California Department of Education Qualified Zone Academy Bond and donations from SolarCity and Pacific Gas and Electric funded the project. The event – as much a fair to highlight green energy and the school district’s various offerings – was also used to tout the district’s 150 Club. The program nurtures partnerships between the district and businesses such as PG and E and SolarCity that help bring a better learning experience for students. Employees promise to speak with students one hour a month for five years – the 1 and 5 in 150 – with the business obligated to donate zero dollars. County schools Superintendent Mick Founts said the program was intended to bring “significant role models” to schools to talk with students about various careers. The first group of professionals several years ago came from area hospitals and the result was higher science scores in that school, said Founts. Pacific Gas and Electric and SolarCity were highlighted as businesses in particular that had contributed to the solar parking lot and the students’ educational experience. He said that it was those sorts of partnerships that will help students find meaningful paths to their future careers. “This is a role model for the whole state of California,” Torlakson said of the district’s partnerships with business. Contact the author about this and other stories at kmichaud@cvbizjournal.com. An international engineered concrete manufacturer expects that building a plant in south Stockton will mean lots of jobs. There will be construction jobs and jobs at the plant itself, but also employment opportunities at local restaurants, hotels and entertainment venues catering to the contractors who will come from throughout the West for the plant’s training center. Local business and city leaders were on hand in early April when they and ARDEX Americas officials broke ground for the new plant. “It’s a great day here again in Stockton,” Mike Ammann, president and chief executive officer of the San Joaquin Partnership, said at the time of the ground breaking. The Partnership had a hand in drawing the family-owned business to Stockton. 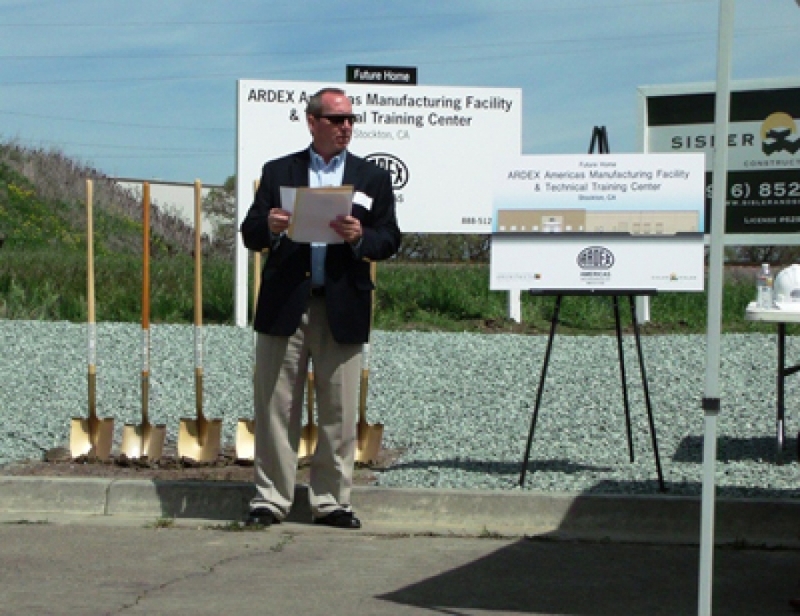 The nearly $9 million, 50,000-square-foot ARDEX Americas manufacturing plant and training center will be on 7.5 acres on Station Drive just east of state Highway 99 between state Highway 4 to the north and East Mariposa Road to the south. It means 100 to 125 construction jobs and a dozen or so jobs once the plant is slated to open in spring 2013. But the training center will see 2,000 to 3,000 contractors a year in and out of the facility, which means hotels, restaurants, and entertainment venues in the city will benefit, said Mike Crouch, ARDEX vice president and chief marketing officer. “We are in the permitting phase and hope to start construction in mid-May,” Jim Masterson, director of strategic projects for ARDEX, recently said. Crouch said the plant, the first for ARDEX on the West Coast, will manufacture premium building materials. The site was selected after 18 months and was picked because of the logistics – state Highway 99 is just to the west, railroad tracks run along the rear of the property, and the Stockton Metropolitan Airport is just down the freeway, not to mention the Port of Stockton nearby. “Smart companies like yours recognize it,” Stockton Councilwoman Susan Talamantes Eggman said of the region’s prime location. The availability of raw materials also was a key, said Crouch. At least some of those relationships were developed through the San Joaquin Partnership. “They’ve been very good to us,” Masterson said of the Partnership. Ammann recognized representatives from other groups at the event and said a “true partnership” brought the plant to Stockton. He said building materials was one of the target industries economic development experts had look to draw to the region. “Today we reap the fruit of our efforts,” Ammann said. He said the region’s location – with freeways, railways, airport, and Port of Stockton all nearby – gives it an edge. Ammann also noted that the region’s population is expected to double over the next few decades. He also predicted an expansion of the facility’s training center as more people become lifelong learners. Sisler and Sisler Construction of Rancho Cordova Rancho will build the plant. The construction is part of ARDEX Americas’ $25 million, five-year strategic project focusing on tile and stone installation products. Beside the construction, upgrades are planned for the Aliquippa, Penn., and Dallas, Ga., plants. Together these projects represent the largest expansion since ARDEX Americas moved its corporate offices, training center, and plant from Coraopolis, Penn., to Aliquippa in 2000. ARDEX Americas is one of 33 businesses that are part of the privately held ARDEX Group based in Witten, Germany, with more than 1,800 employees worldwide. STOCKTON – Economic recovery in California will remain at a slow pace for the next few years, but there are some glimmers of hope. Real gross state product will grow at an average of 2.5 percent for 2012 and 2013, according to the report, and jobs will increase at 1.5 percent. The pace of the recovery gradually will increase as housing and construction pick up. The Business Forecasting Center, part of Pacific’s Eberhardt School of Business, produces quarterly economic forecasts of California and 10 metropolitan areas in Northern and Central California, including Stockton and Modesto. The report noted that the state’s current unemployment is about 11 percent and that it was expected to remain in double digits through the last quarter of 2013. “The regional outlook predicts that 2012 is the first year of economic recovery in the hard hit Central Valley,” reads the statement released with the report. “Further government spending cuts remain a risk for the Valley recovery, especially in the Sacramento and Fresno areas. 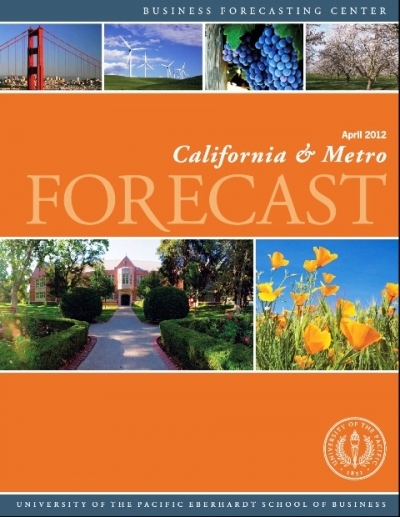 The recovery remains sluggish throughout California and the economy will grow at 2.5 percent in 2012 and 2013. That is a very slight improvement from the first two years of recovery when growth in real gross state product averaged less than 2 percent. Unemployment in the state has declined to 11 percent, but will decrease more slowly over the next year. It will remain at about 10 percent until the fall of 2013. While payroll jobs continue steady growth, the state will recover only about 25 percent of the jobs lost in the recession. Non-farm employment will recover its pre-recession peak in the first quarter of 2016. Real personal income is expected to exceed the peak of 2008 in the second quarter of 2012 because of stronger recovery in non-wage income an d higher wage industries such as technology. There will be nearly 300,000 construction jobs will be created over the next five years, which will be about 24 percent of the state’s total non-farm job growth. But even so – and despite leading the job growth in the state from now until 2016 – there will still be 100,000 fewer construction jobs in 2016 than before the recession. Manufacturing employment will strengthen in 2012 and will increase by 32,000 jobs. Health services is the only private sector to experience consistent job growth throughout the recession, adding nearly 25,000 jobs per year throughout the recession. Health care employment will grow at a slightly faster rate in the coming years, adding over 30,000 jobs per year in 2012 and 2013. An effort to pull the Central Valley from protracted economic doldrums is moving to the next phase, one that ultimately could provide small businesses with resources they desperately need, a friendlier business climate they desire, and a trained workforce they badly crave. Stu Gilman, chief executive officer of External Resources Inc., which provides professionals to fill interim and permanent openings in private and public sectors with offices in Stockton and Modesto, over the course of several months invited a broad range of leaders in various fields to join as focus groups to discuss what was needed to put the Central Valley back on the road to prosperity. “Last fall we decided to demonstrate our commitment as a Central Valley community leader by partnering with public and private sector leaders, CEOs, and other professionals to identify the unique needs, business development services, and solutions necessary to promote a healthy Central Valley economic recovery using a well-planned and orchestrated systematic approach,” reads a portion of External Resources’ report that came from those focus group meetings in December, January and February. Gilman said the focus group objectives were to gather “involvement from the Central Valley public and private sector community and business leaders that allows us to understand the specific needs unique to our business climate” and find a starting point from which those people could come up with a priorities and a plan for relevant solutions and measurable results. In April and May, External Resources reported back to the people who were in those focus groups and others to get more input and decide how to move forwarded with a comprehensive way to help businesses. Several possible solutions were presented in the report, including a undertaking a marketing campaign to change the perception – internally and externally – and enhance the local economy, create a marketing campaign to draw large businesses to relocate to the Central Valley, create a one-stop resource directory or clearing house for all business services, create and support programs to educate the workforce to become more skilled, and accelerate and streamline the compliance and regulations process. People interested in attending the last of the meetings to discuss the report should contact External Resources Inc. at 209-491-2200 or visit www.externalresources.net. Daffodils and white birch trees anchor the scene that opens onto a cascading waterfall with evergreens and snowcapped mountains in the background. The image is comforting and vivid enough to invoke sensory memories of cool, crisp spring air blowing down from the mountains. It takes on an even warmer glow with golden sun shining through the image. 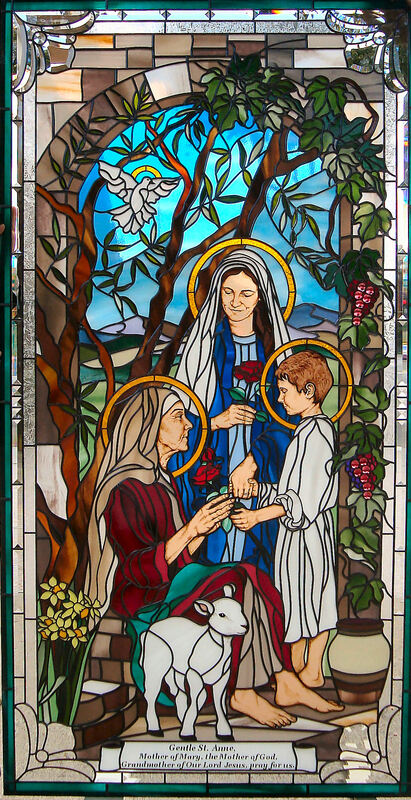 “At the end of the day we come up with some spectacular pieces,” said John Mullins, owner with wife Mary of Valley Rose Designer Glass in Modesto. 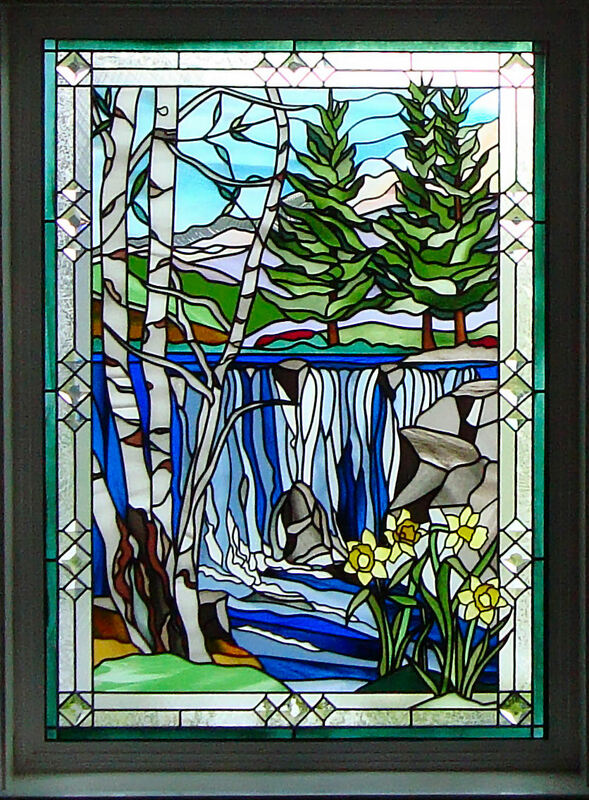 The family owned business offers traditional stained glass, stained glass overlay, and textured glass for residential, commercial, and religious applications, although churches have been the business’ most reliable clients over the past few years. “They have been our mainstay,” Mary Mullins said of work for religious buildings. The Mullins offer art glass for a variety of uses. Some homeowners want sunlight to come through a window or door, but also want the privacy that art glass can provide. And stained glass has been in churches and other religious buildings since the art form began. With a downturn in residential building, spiritual projects have kept the business going. From work at a monastery in Redwood Valley to work at churches from St. Anne’s Catholic Church in Lodi to St. Joseph’s Catholic Church in Modesto and beyond, Valley Rose has kept fairly busy. The couple spent about six months to a year researching going into stained class and decided on a Stained Glass Overlay franchise. “It was a good start for us,” Mary Mullins said of the franchise. They started the business in 2004 after John Mullins suffered a layoff from his job as an accountant. “To go out and try to do something on our own. … It’s been a leap of faith,” said John Mullins. After three years running the business out of a studio, the Mullins set up shop in their garage. Mary Mullins, armed with an ever-growing portfolio, meets with prospective clients. From those discussions, she designs a piece for the client. the pieces in their Modesto garage. The portfolio has grown, said Mary Mullins, because of the variety of jobs they have handled over the years. At first, it was standard offerings for entryways to add a certain amount of privacy, but it has transformed to being able to offer one-of-a-kind pieces such as the scenes from Yosemite National Park that a wife ordered as a surprise for her husband. John and Mary Mullins hoped to get back to the glass business full time once the economy recovers more. “That would be ideal,” said John Mullins. Contact Valley Rose Designer Glass by calling 209-238-3236 or emailing the business at valleyrosesgo@yahoo.com. STOCKTON – Federal officials last month lauded a Port of Stockton biodiesel firm for its “phenomenal” progress since it was founded in 2005. Community Fuels – which doubled its production from 2009 to 2010 and then tripled it from 2010 to 2011 – was the backdrop March 20 as the U.S. Department of Agriculture highlighted the 2008 Farm Bill’s achievements in rural and farm-related projects. The visit came as Agriculture Secretary Tom Vilsack released a report highlighting the ways USDA Rural Energy for America Program (REAP) contributes to the nation’s energy independence and helps rural small businesses and farmers become more energy efficient. Community Fuels now produces 30,000 gallons of biodiesel each day. That goes to oil producers, refineries, and fuel distributors, often to be blended with conventional petroleum-based diesel. The idea is to provide a cleaner, sustainable fuel that improves air quality while reducing dependence on foreign oil. The downside is that biodiesel and other clean energy “do not pencil out yet,” said Brown, and producers such as Community Fuels rely on government incentives. The USDA payment program in California has paid out $1.6 million so far to 13 companies. 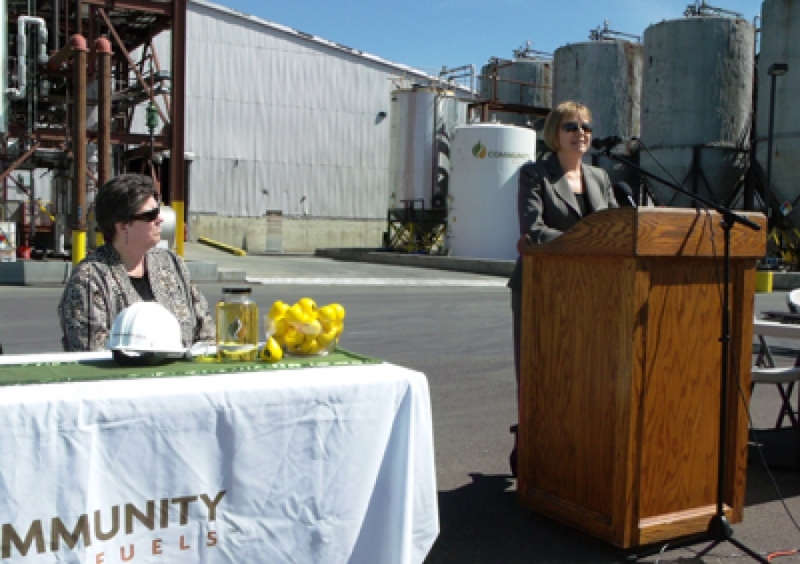 Community Fuels, which received $567,000 from the Advanced Biofuel Payment Program based on its fuel production, is the largest producer. Lisa Mortenson, the company’s co-founder and chief executive officer, said that money allowed Community Fuels to increase production by 125,000 gallons a month and hire six employees. Mortenson introduced some of those employees hired because of the funding, including Tammy Martin, the company’s procurement and logistics manager. “Tammy is an example of a real job, a real employee due to USDA funding,” said Mortenson. She said Community Fuels started with a vision to develop clean, sustainable fuel that would help improve air quality. The result “with that vision in hand and a lot of very, very hard work” was the development of a fuel that could force conventional petroleum-based diesel engines into retirement, said Mortenson. “It’s a terrific fuel,” Mortenson said of Community Fuel’s product. Keith Michaud has been a journalist in Northern California for more than two decades working at small- and medium-sized newspapers. He has worked as a staff writer, copy editor, assistant news editor in charge of special sections, opinion page editor, assistant city editor, staff writer on a newspaper website, and editor of a regional business journal. Today he is the media relations coordinator for University of the Pacific in Stockton, Calif. (http://www.pacific.edu) He can be reached via keith.l.michaud@gmail.com.